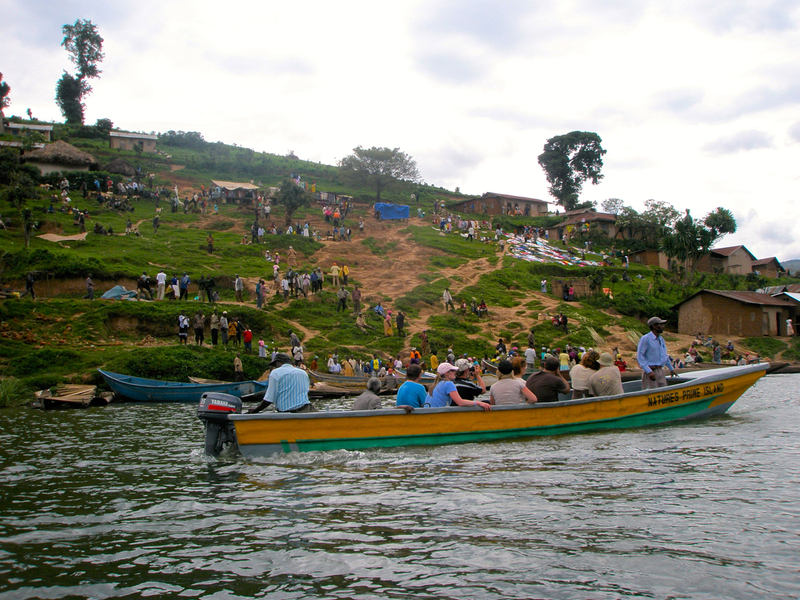 After leaving the mountain gorillas and Rwanda behind, we stopped in a place called Kabale, a small town in southwestern Uganda, for a day trip out on nearby Lake Bunyonyi. 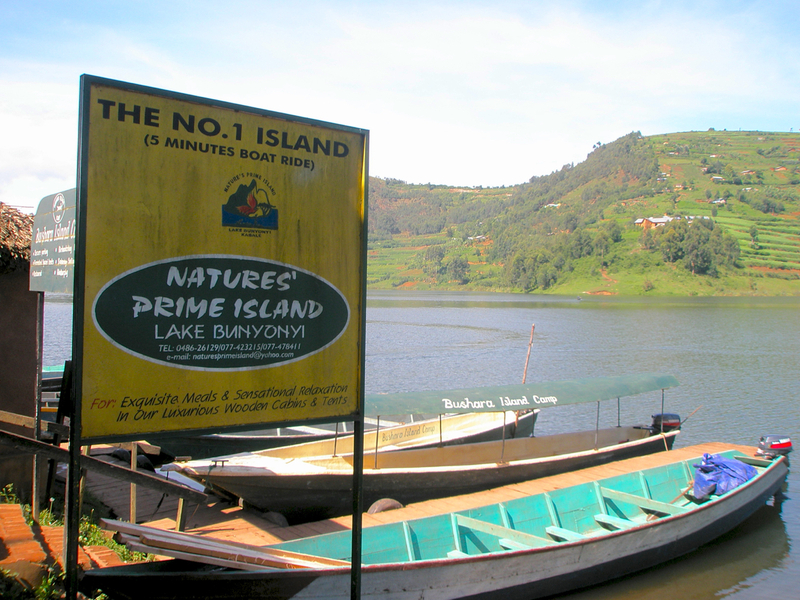 Known for the terraced farms in its surrounding hills, crystal clear water, and numerous islands spotted throughout, Lake Bunyonyi has become a popular tourist destination for those interested in watersports or relaxing at one of the many lakeside resorts that dot its shores. Our day trip was going to be a full one, complete with a cross-lake cruise and tour, a walking tour of some of the farming villages along its hilly shoreline, a visit to a local village for a cultural dance celebration, some time spent perusing a lake-side market, and finally some time to relax over dinner served at one of the resorts. It was going to be a long day, but we were all excited about a new place to explore and a new adventure to be had. 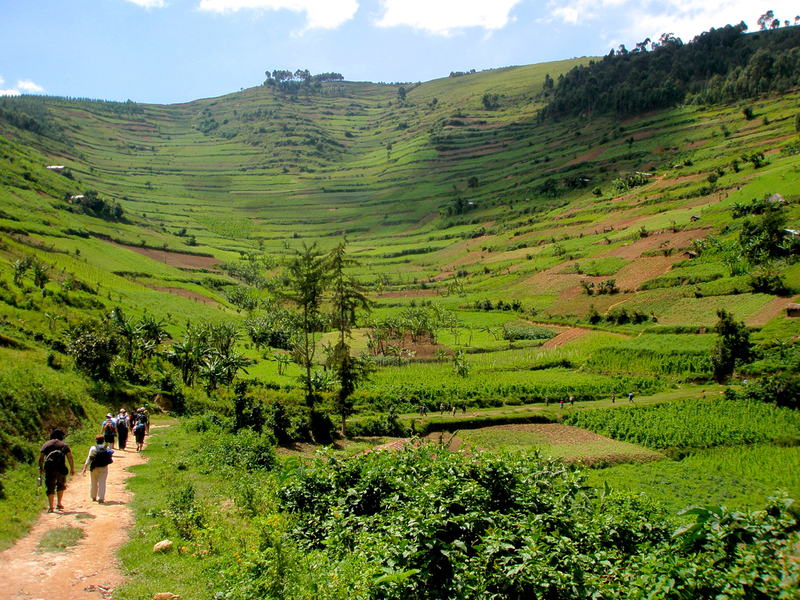 Western Uganda is a hilly region, covered in lush, green grasslands and dense, overgrown jungles. The higher altitude brings milder climates, and as we wound our way through the peaks and valleys toward the lake, we were happy to find ourselves cruising along in cooler, fresher air- a break from the stifling heat we had experienced in Zambia, Tanzania, and Kenya. Palm trees towered on either side of the red dirt road, massive palm fronds rustling in the breeze and shading us from the sun. Local children, in typical African fashion, waved and called out “HELLO!! !” as Peeky rumbled through the villages. It was a beautiful sunny day, billowy white clouds hiding the sun as they passed overhead, the Ugandan landscape stretching out in every direction- just a great day to be in Africa! 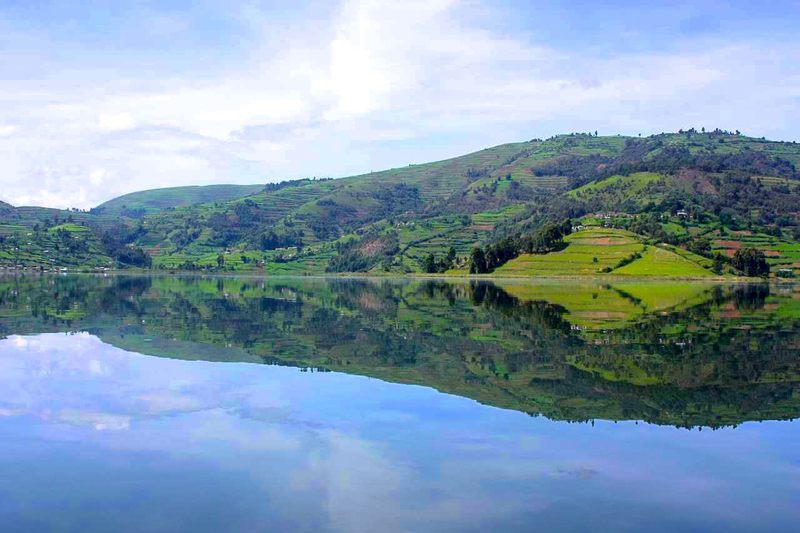 Eventually, we came to a pass in the hills, and as the truck slowed to a stop on the side of the road, we caught our first glimpse of Lake Bunyonyi. In a word, it was magnificent- a narrow ribbon of blue nestled down in the green valley before us. The surrounding hills stretched to the horizon, the terraced farms giving a well-manicured and ordered appeal to the entire scene. Thatch-roofed homes were clumped together amongst the fields in tiny villages, each clinging desperately to the sides of the hills, fighting to stay put against the forces of gravity and erosion. Honestly, it reminded me of the scenery I saw when trekking in the Annapurna Region in Nepal (save the 8000m+ peaks of the Himalaya, of course)- terraced fields on impossible slopes, tiny villages spotted along snaking walkways that made their way along the hillsides, and green, green, green- everything a lush, vibrant green. Combine this with the lake snaking its way through the valley, and it all was quite beautiful. We hopped back on the truck, made our way down to the dock, and in a few minutes time, were buzzing across the lake, our guide shouting out points of interest over the drone of the outboard. We passed by various islands, each having a historical name and significance, the most memorable being a place called Punishment Island- an island with the sad history of being the isolated place where local tribal women were sent if they became pregnant out of wedlock. This practice ceased in the first half of the 20th Century, but the place remains as isolated and desolate as it was during its horrific past, and locals believe that it is haunted by the spirits of those who died there. Needless to say, we didn’t stop. We continued across the lake, laying back and enjoying the scenery, eventually pulling into a make-shift ‘dock’ and clambering ashore. We hiked up the path to the top of the ridge, and set out on our epic journey towards the village we were supposed to visit for a cultural dance celebration later in the afternoon. Inevitably, local children appeared out of nowhere, eager to walk along with us, each shy at first, but all laughing and playing, pushing and pulling, holding our hands and tugging us faster down the path. We hiked along a dirt road that the locals used as their ‘highway’ between villages- a one-lane thoroughfare pockmarked with animal droppings and potholes, cut by waterways and irrigation run-offs, dirt, pebbles, and sand trodden down under countless feet and hooves to create a form of ‘African asphalt’. At last, we came to the turn-off for the village we were intended to visit. We were invited into the village’s center- the ‘gathering place’- where we found what must have been all of the inhabitants waiting for our arrival. We were roundly greeted by the village elders, and introduced ourselves accordingly. The purpose of our visit was to learn more about the villagers’ lives in their communal agrarian society, and to be a part of a traditional welcome dance and celebration. After all of the introductions, we were shown to our seats, and the show began. What a show it was! It was incredible- the singing, the dancing, the shouting and shuffling of feet… First the women got into it, singing a beautiful song in Ugandan tradition, none of which we could understand, but still somehow got the gist of the meaning. Their voices seemed to echo off the surrounding hillsides, reverberating through the valley and carrying across the lake to the villages beyond. Claps and loud shouts, jumps and twists, all intertwined with their song- it was amazing! Before long, the men joined in, and then of course the children couldn’t help themselves- EVERYONE was singing, clapping, shouting, and dancing. They were working up a sweat, really getting into it, jumping higher and higher with each round, singing louder and clapping harder. We were all enthralled, captivated by the performance. After the mighty crescendo, the voices and claps began to slowly fade, the song reaching its conclusion. We erupted into applause and yells of gratitude, all met with huge smiles and shy laughs. This was followed by an invitation to join the villagers in the next song and dance, which we all gladly accepted. Truth be told, we were pretty bad at the beginning, but eventually got the hang of it. The children helped a lot, demonstrating everything for us again and again until we got it. Before we knew it, the villagers were once again in full song, shouting and clapping, dancing away, and making room for us on the ‘dance floor’. It was hilarious- the group of us trying to keep up with the villagers, the villagers falling over in fits of laughter at our hopeless efforts and antics- too funny! Finally, the song came to an end, and we all collapsed onto the ground, laughing and panting, sweating and smiling. What an experience! After the dance party, we spent about an hour in the village, recovering for the most part, but also conversing with the villagers and playing with the children. We asked them all about their cultures and customs, and they were even more curious about where we came from and what our countries were like. Some spoke very good English, some hardly any at all, but somehow, we all managed to get our thoughts across. We got a tour of the village, and were again shocked by how little these people seemed to live on, and even more so by the fact that they were happy and content. It is truly amazing how full the lives of such simple people seemed to be. We thanked them over and over again for their friendship and hospitality before leaving, all sad that we had to go. Once again, the children led the way, back down the path and onto the road back towards the place we left the boats. It was getting late in the afternoon by then, and we had to hurry to make it back to the boats and across the lake to our last stop. The locals had their weekly market set up on the hills as we made our way down to the boats, but unfortunately, we didn’t have much time to wander around and see what they were selling. We hopped back into the boats and headed towards the resort where we were booked in for dinner. We pulled into the docks of the resort, climbed out of the boats, and made our way up the hill to the main building of the resort- an open-air hall with an extensive porch and plenty of chairs to lounge around and relax in. The bar was open, and a cold beer out on the porch sounded like the perfect way to wrap up the afternoon. As the sun set, dinner was served- buffet style, a delicious spread of traditional Ugandan food- rice, seasoned beef, potatoes, vegetables, and chicken in a spicy red sauce. Of course, after a long day in the sun, a couple of beers at the bar, and a filling dinner, we were all ready to find our tents and sleeping bags. We hopped back into the boats, and quietly idled across the lake back to where our day had begun. Peeky was waiting for us, and as we wound our way back to the campsite in Kabale, I’m certain we all dozed off. What a day!